Bone grafting gives us the ability to transplant bone grafts of proper length and width into the jawbone to form a stable foundation for dental implants, enabling patients to enjoy the functionality and aesthetic appearance of high-quality artificial teeth. High-quality dental implants look, feel, and function like natural teeth. For some people, the jawbone associated with missing teeth atrophies or is reabsorbed and is not substantial enough to support dental implants. In the past, this meant that many patients with deteriorated jawbones were not candidates for dental implants. Today, modern advances in oral surgery have allowed surgeons to grow bone where it is needed by using a procedure called bone grafting. Bone grafting is an effective approach to repairing implant sites with inadequate bone structure. Since bone tissue is able to regenerate and grow, strategic placement of bone grafts can encourage bone growth where it is needed. After the graft has been placed, the bone generally needs to heal for a period of four to nine months. The material used for a bone grafting procedure is determined by several factors and varies from case to case. Large defects are generally repaired using the patient's own bone. If our oral surgeons determine that this is the best course of action in your individual case, the graft will be harvested from your jaw, skull, hip, or lateral knee, depending on the amount of bone needed for the graft. Major bone grafts are typically performed to repair defects of the jaw that result from traumatic injuries, tumor surgery, or congenital defects. In other cases, bone from cadavers or synthetic materials may be used for the graft. Additionally, bone morphogenic protein (BMP) can be used to stimulate the formation of new bone. This product can be used in lieu of grafting a patient's own bone, avoiding a donor site, and providing the best possible bone for implants. In some cases, bone grafting procedures are often used with banked bone while others are performed in an operating room and require a hospital stay. During the bone grafting procedure, bone will be harvested from appropriate sites and transplanted to the part of the body where it's needed. In some cases, our oral surgeons may insert special self-dissolving membranes under the gum to protect the bone graft and encourage bone regeneration. Our oral surgeons will discuss the details of your specific case during your initial consultation. In some cases, patients may require sinus lift surgery. If your upper teeth are removed for any reason, only a thin layer of bone will separate the maxillary sinus and the mouth. This can become problematic because dental implants require bone to hold them in place. If the sinus wall becomes very thin due to bone loss, it is impossible to firmly anchor dental implants. In these cases, a special bone grafting procedure called a sinus lift may be necessary. Why do I need bone grafting for dental implants? In cases of inadequate bone density, you may need a bone graft to create a stable base for dental implants. During the process of a bone graft, your gum and jawline are prepared to be stable enough to act as a foundation for dental implants. 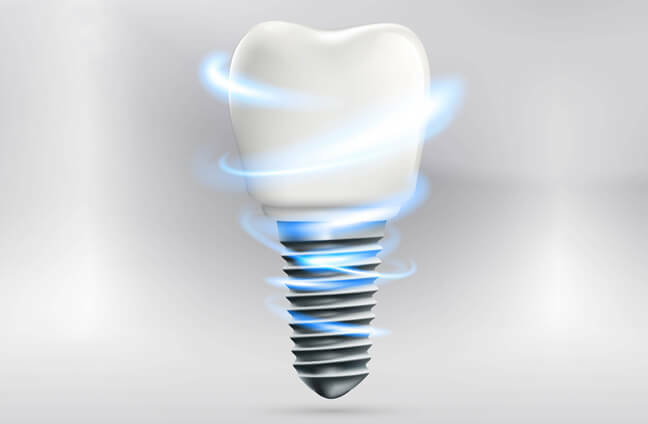 The base of your dental implant needs sufficient bone density to bond with during the process of osseointegration. Osseointegration is the act of a dental implant adhering to your living jawbone to create a sturdy base for durable, long-lasting dental implants. How does jawbone density affect future dental implants? Your jaw ridges must be strong enough to support future dental implants. You have 2 jaw ridges that are also known as your alveolar ridges. These ridges are behind your upper and lower teeth and hold the sockets of your individual teeth. Your alveolar ridges contain the alveoli of your teeth, which are the small cavities that hold the roots of your teeth. In most cases, when a tooth is removed, the socket heals and fills itself with natural tissues. In some cases of tooth extraction, your alveoli may break or not be regenerated and filled with natural tissues. In cases where an alveolus remains open or breaks, you may not have proper bone density to receive dental implants. How long will I need to wait after a bone graft to receive dental implants? While the recovery time is different for each patient and depends on the extent of bone grafting and your body’s own rate of healing, the majority of patients wait between four to nine months after a bone graft before receiving dental implants. This recovery period allows for your bone graft to effectively bond with your existing jawbone. After a successful bone graft, you will have sufficient bone density to support dental implants. What material is used for bone grafts? The materials for a bone graft vary from patient to patient. In most cases, the bone graft can be performed using your body’s own bone. This type of bone graft is referred to as an autograft. On the other hand, an allograft uses material from another patient for your bone graft. Finally, an alloplastic graft uses a manmade or synthetic material for your bone graft. Our oral surgeons will discuss the best option for your individual case. What are some common side effects after a bone graft? You may experience slight discomfort, swelling, or bleeding following your bone graft procedure. Any discomfort can be soothed through prescribed oral medications. Swelling is your body’s natural reaction to a bone graft. Swelling may not be immediately present and may form one to two days following your bone graft procedure. The application of ice packs can help reduce the severity of swelling. Finally, a small degree of bleeding is normal along your incisions. We may place a sterile gauze pad after your bone graft to keep your incisions clean. Bleeding should subside a few hours following your bone graft surgery. How can a bone graft help me when my jaw is not wide enough for implants? For some patients, the jaw isn't wide enough to support dental implants, and a bone graft is needed to alter the height or width of the jawbone. This technique is called a ridge expansion and restores the jawbone to make it wide enough to support conventional dental implants. During a ridge expansion, our oral surgeons will use a special saw to carefully divide the jaw along the top ridge, expanding the width of the jaw and creating enough space to insert bone grafts. 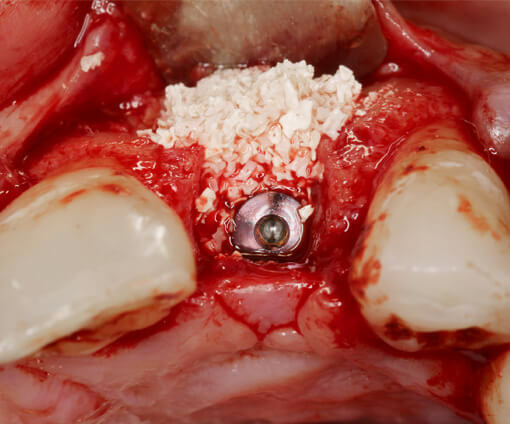 For some patients, dental implants can be placed immediately following the ridge expansion. In other cases, the bone will need time to heal first. Our oral surgeons will discuss the specifics of your case with you during your initial consultation. How can I find out more about dental bone grafting? For more information on bone grafting, please contact Staten Island Oral & Maxillofacial Surgery to schedule an appointment with oral and maxillofacial surgeons David Hoffman, D.D.S., F.A.C.S., Lydia J. Lam, D.D.S., Steve Yusupov, D.D.S., M.D., and Mark Stein, D.D.S., M.D. at 718.226.1251.